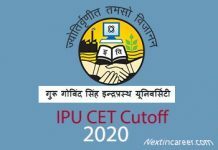 IPU CET Result 2020: After the exam is successfully conducted, GGSIPU will release the result of IPU CET. The results will be declared separately for each course in the online mode on the official website. Candidates who are waiting to check the IPU CET 2020 result can check the same in 3rd to 4th week of May 2020. The IPU CET result will reflect the qualifying status of the candidates who had appeared for the examination. After the results have been declared, the cutoff will also be released. It must be noted that the IPU CET result will be published separately for B.Tech and B.Tech Biotechnology candidates. Candidates must prepare well for the examination to score well in the IPU CET exam 2020. Go to the B.Tech segment and click on ‘PDF’ in the format column. The IPU CET Result which is also the rank list 2020 will be displayed. After checking the result, take a print out of the same. IPU CET 2020 or Indraprastha University Common Entrance Test 2020 will be conducted in the offline mode and the results will be declared online. Candidates must know that the Results of IPU CET 2020 will not be available offline anywhere and neither will be sent through the post for any candidate personally. Candidates will be able to download the scorecard after the result is released. Those candidates who wish to review their answer sheets can do so within 5 days of the declaration of the Result. To do so, candidates will have to mention the specific objections which they have in accordance with the proforma that will be laid down in the official brochure o IPU CET 2020. To raise the objections, the applicant has to pay an amount of Rs. 1000. This fee has to be paid in the form of a bank challan and has to be submitted at the Indian Bank Branch in the University Campus. A committee will look into the raised objections and will revise the IPU CET Result 2020 if need be.